Subject: Walking sticks, a sign of age?? Walking sticks, a sign of age?? I cut a bunch of saplings so I made myself and a few others some nice handy walking sticks. We called them hiking sticks in boy scouts, lol. I have bought several at craft shows over the years, but my favorites are ones I have made. 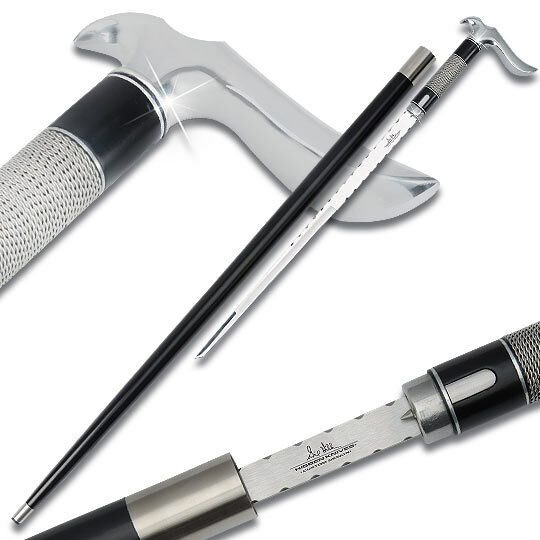 Nothing fancy, just a functional tool when walking in the woods. Keeps the spider webs at bay too. My long time favorites were made from dogwood, boy they are strong and last for ever. I just made a nice one from cherry, it feels strong and is finishing out very smooth. Here is what I have found about the different woods. Maple does not last. Pine works but can stay sticky. Oak works good but is heavy. Hickory is a little bit better then oak. Dogwood is the best. You can even get it from a dead tree. If you want to peel the bark peel it green. If you a finish use linceed oil and rub the wood with a bone or deer antler before you apply linceed oil. A walking stick is a handy tool. So what is your favorite walking stick? Re: Walking sticks, a sign of age?? I had a bum knee a couple years back. I had trimmed back a snowball bush just prior to the knee giving me trouble. I saved Some of the larger pieces that were about 4 feet long thinking I could use them as handles for whatever. I was having a rough time walking so I picked out one of the larger pieces of snowball bush and pared it down to the length that felt best to help me get around. I used it for several months and it is still in my garage should I feel the need to have it again. I left the bark on it and pushed a rubber tip on it. Works. Danged glad to have it at the time. 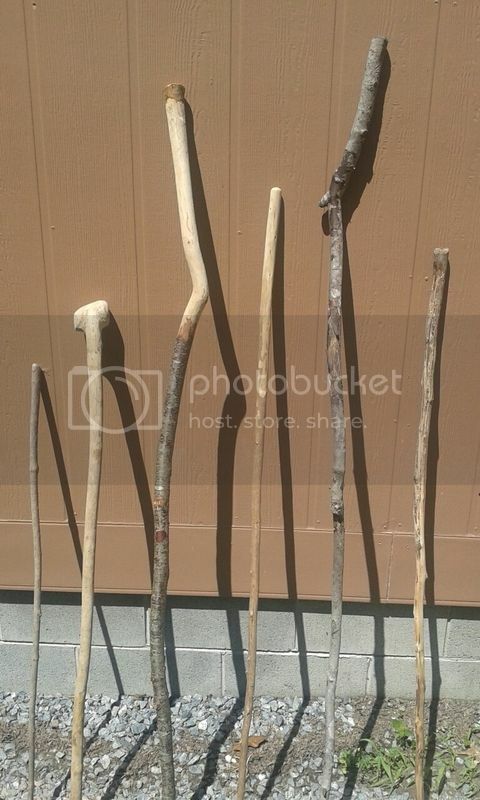 Nice collection of walking sticks Steve. Thanks for sharing the picture and info. Left to right. Dogwood dogwood cherry cedar maple maple. Not home made, but on topic I think. My mother is 90 years old and pretty infirm, although not bad for her age. I was at a thrift store a few years ago and ran across some ski poles. Not knowing if it was a good idea or not, I got them and had her try them out for size. She uses one at a time, keeps one by the front door and one by the back door and walks with it out in her yard. Maybe not for everyone but works well for her and they don't weigh hardly anything. Here's mine. 20 year old hickory and still has the bark on it. Nice stick. I have a dogwood one that is 20+ years old. I never could quite see the point of lugging around a large stick. I can see a cane if you need the support, but if you are having trouble walking, do you really need to carry the extra weight? You must not have been a boy scout. Walking stix have many uses. Some of the best ones as you mention are of Dogwood. I've been a tree man my whole life and look for unusual pieces of wood. The walking sticks I cut usually have a vine that wraps around the stem. Gives them an interesting look when the tree caluses over. I dig out the vine and strip most of the bark, leaving some for interest. A coat of Orange shellac looks great also. The auction house near me has some that go through it and the usually bring a good penny. Someone has interest.